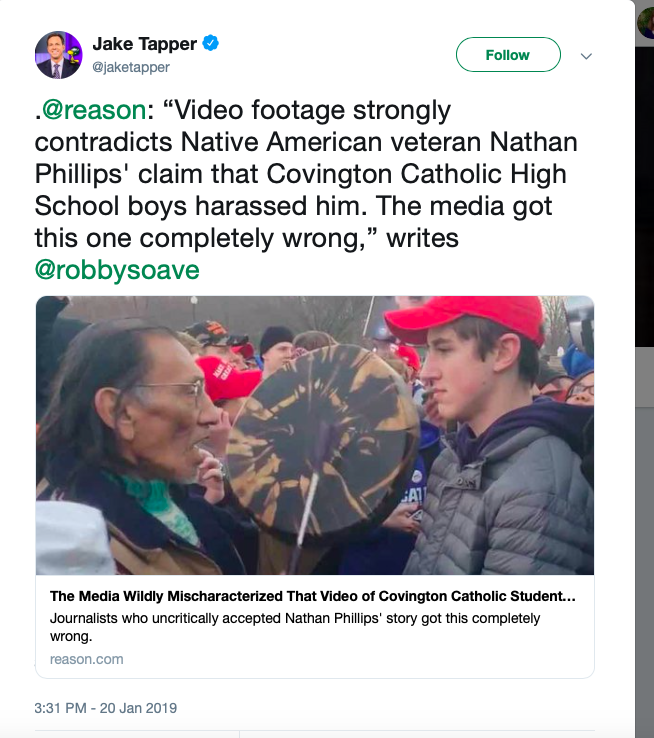 Boys from Covington Catholic High School in Kentucky were harassed by an indigenous group led by Nathan Phillips, wanting to score points from the very people included in their hate. (“White people, go back to Europe. 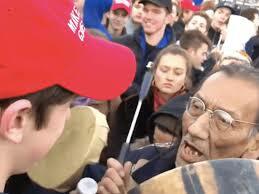 This is not your land…f-bombs and curses.…) A selectively cut video portrayed a confrontation between a proud, elderly Native American Vietnam veteran (Phillips) surrounded by a group of boys wearing MAGA hats. One boy—Nick Sandmann— is standing up close, with a smile on his face—a sneer we conclude— while others jump up and down seeming to mock the poor old man. Media reacted swiftly, attacking the boys while oblivious to the hateful behavior by the adults. Watch what really happened here. In reality, it was the adults that aggressively went after the boys. A chaperone, wanting to diffuse the situation, told them just to chant their school song, which they did. In our family, our children are part Native American from my husband's side and we have two black sons, all who would have been jumping around, chanting like those boys, not doing it to be disrespectful. But, the false narrative went viral. Condemnation was sharp, calling for the boys’ suspension and worse. CNN jumped in with a scathing report, treating Philip ever-so-gently while disparaging the boys. The school issued an apology. A petition was launched demanding major changes at the school, including firing the principal and ending trips to the March for Life. The school closed their Facebook page and made their Twitter account private. On their website, was an apology for the students’ behavior and a promise of consequences. The Roman Catholic Diocese of Covington put the same message on its website. By Tuesday morning, the whole website was down. Finally, on Wednesday, the archdiocese apologized to the boys for reacting too swiftly. It is telling that liberals, thinking some high school boys had acted disrespectfully, responded with threats of violence and even death. The main student targeted, Nick Sandmann explained: “I believed that by remaining motionless and calm, I was helping to diffuse the situation.” You can read his full statement here. 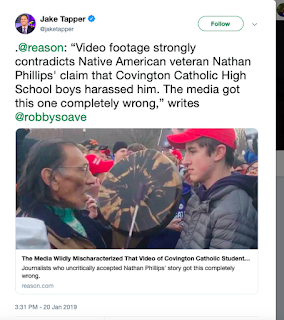 Some—such as CNN’s Jake Tapper—apologized or at least acknowledged a rush to judgement. The National Review also published an explanation and an apology. Some, however, continue the false narrative. Surely, they know the facts by now. Or they don’t want to know. * Wait to hear the other side, even if you see a video. * Scandal spreads like wildfire. Truth moves slower. There is a tsunami of hateful tweets and even death threats still going after Nick. * Hateful activists don’t care who gets hurt. * Life isn’t fair. The boys were quickly attacked while adults who sought to hurt them got a free pass. * We are called to forgive and pray for those who hurt us. Jesus taught us to love our enemy and pray for our persecutors. Pray for Phillips and friends. * Chaperones and students attending the March for Life should be prepared ahead of time about how to react to hostility. * Minding your own business doesn’t guarantee you won’t get dragged into a storm. * When you cry wolf—especially at the expense of others—surrender your reputation. 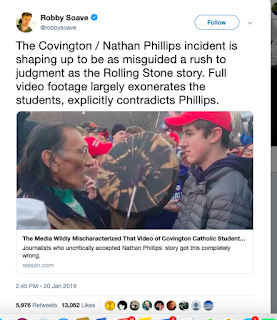 In 2015, Phillips, confronted college students wearing Indian garb at a college party, and claimed they disrespected him. Anyone believe him now? * CNN does sloppy reporting. They jumped in to further an agenda, abandoning journalistic integrity with no recognition that foul-mouthed adults went after the boys. * Michael Green, an influential, Hollywood, screenwriter is a bully. 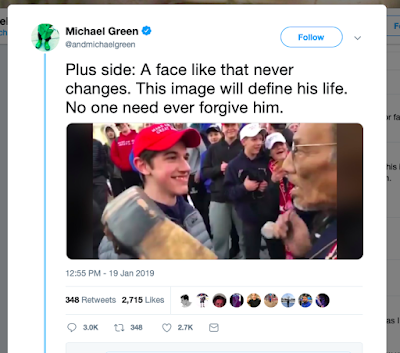 He tweeted that Sandmann should “never” be forgiven and wanted everyone to know what he looks like. Even if a teenage boy had behaved badly, why would an adult want his whole life to be ruined? The tweet is still up. 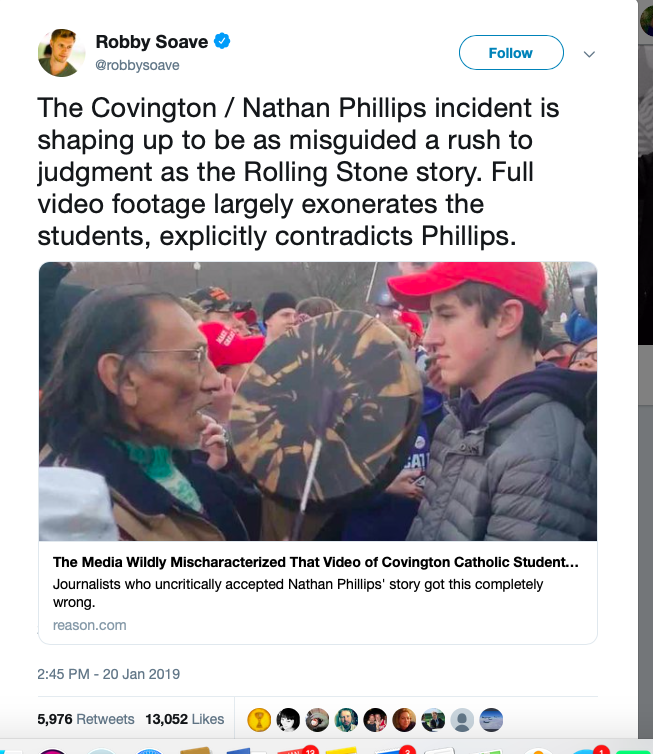 ·* Unfair treatment such as the Covington boys experienced, and worse, has been suffered before by many minorities in our history. It is always wrong. Initially, I was saddened at what seemed to be the boys’ bad behavior. Now, instead, I am proud of them—they remained calm and did not attack back. I will be even prouder if they forgive and pray for those who sought to hurt them. Martin Luther King Jr., whose holiday it was as I wrote this, condemned hatred and bitterness. He promoted love and respect, and thus he spread both. People like Phillips promotes hatred and division and thus, he spreads both. “Darkness cannot drive out darkness; only light can do that. Hate cannot drive out hate; only love can do that,” Martin Luther King Jr.